This is a VERY useful home care activity for clients with chronic trigger points in the hips. This not only includes clients with hip pain but pain that extends down the side of the leg, down the back of the leg and seizing hamstrings. Your neuromuscular therapist can use assessment to pin point the spot where you need to focus your work. Lay on a tennis ball so that it presses into your hip. Gently work the tennis ball around in a spoke like pattern, focusing on the tender spots and the areas recommended by your therapist. Here is an illustration showing the pattern in red lines. Okay, that sounds easy, but lots of clients have trouble with this. Find a ball and a surface that is right for you. Some clients want more pressure, so they use a tennis ball on a bed or even a racket ball. Other clients want deeper pressure so they use a baseball on a hardwood floor. It is hard to relax into the ball when it is too painful and aggressive on your hip. Don’t work this too long. You can end up quite sore if you’re too aggressive, especially in the beginning. Focus on softening the trigger points, it is unlikely to that you will release them completely. If you make yourself sore, use a hot shower and massage or ice and stretch for relief. You probably won’t find the right spot as easily as I do in this video. I know my anatomy and trigger points well. 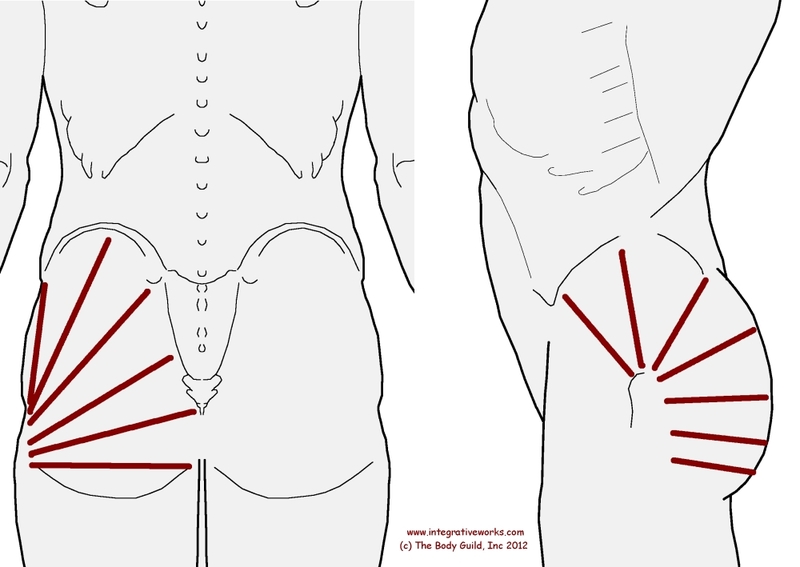 The most common problem is that the client has not rolled onto their side to catch the critical trigger points near the front corner of the hip. Get your neuromuscular therapist to help you find the right spots, if you need help. This is a solid home care routine and is used extensively by seasoned therapists. It will give you relief in between sessions. Your neuromuscular therapist will have more time during your session to deal with the underlying problems and balance the pelvis for longer lasting results.